In the last game of the tournament I faced Jonathan and his Beastie Boyz. I have always a great respect for BoC players. They have a very interesting army to play with but the one that is not that easy to lead. It has a unique character but due to some stupidity during design process their most characterful beasts are way too expensive. As always sincere apologies for the lack of information on all magic items. I am sure level 3 had some protection and there were a dispel scroll somewhere. In general and interesting army with an option to summon big guys if appropriate spell is rolled (not so easy with level 3 though). A lot of support units meant that I will have an interesting deployment phase. Of course I could suspect big blocks will stay together and also close to the herdstone. 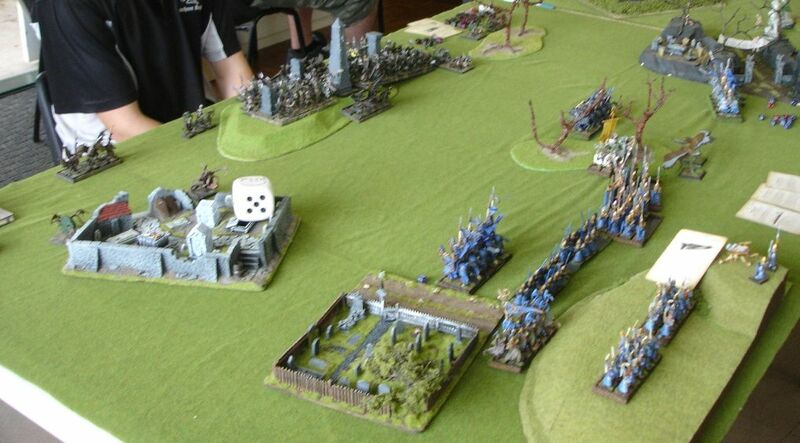 But the exact position of razorgors and chariot was important to the battle of support regiments. 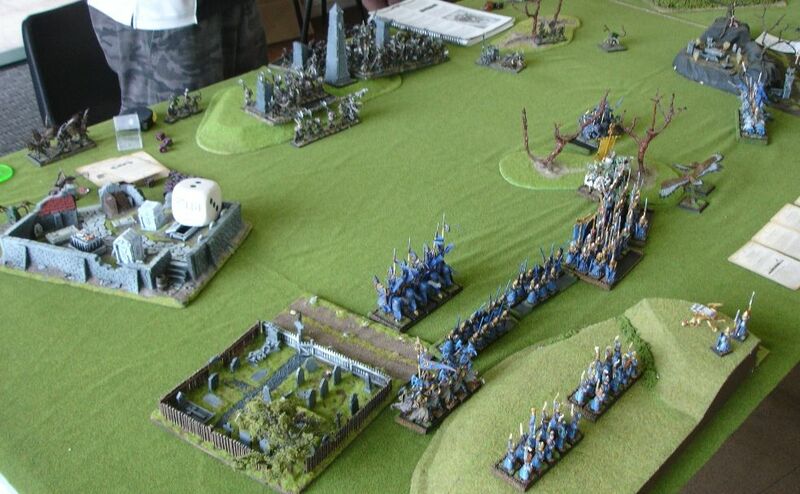 The battle I had to win and win quickly if I wanted to have a chance to surround these big regiments. Gors and Bestigors, with their Primal Fury, are very dangerous if at full strength. Hence I also wanted to try and thing them down before we enter the combat. If I could focus my shooting at any of these regiments I could inflict some serious damage. 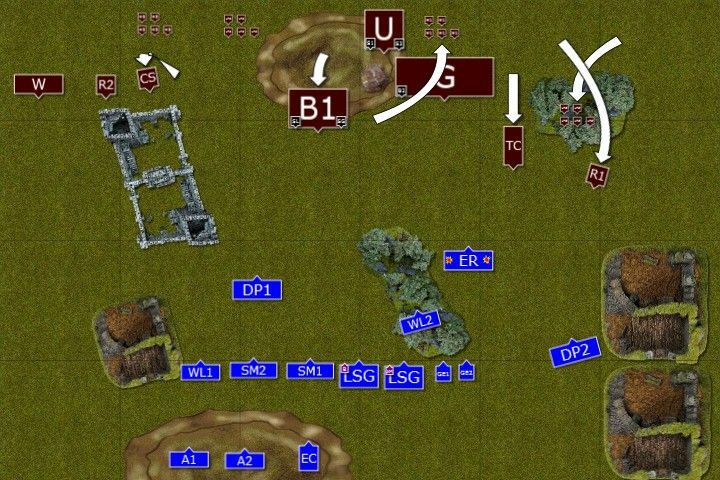 The trick is I also need my shooting to clear out support troops :) In that case I decided to use my shooting to eliminate tougher support troops (if possible) and only if I achieved that I would move to targeting big units. That plan was also a subject to the target availability. Another challenge I was about to face was magic. With 8 spells to choose from, 4 channels rolls and herdstone I was sure I would be outmatched. Hence I had to carefully choose what to dispel and live with what I could not. As you can see there is a significant amount of terrain on the table. 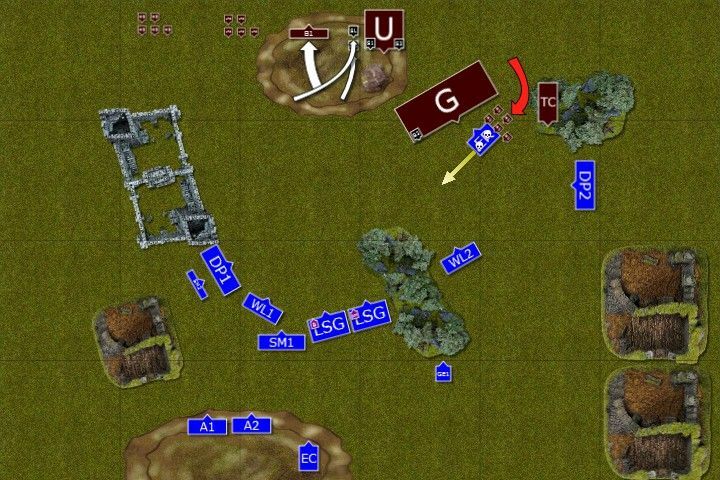 The bigger piece of ruins on the right flank was impassable while other ruins were dangerous terrain. 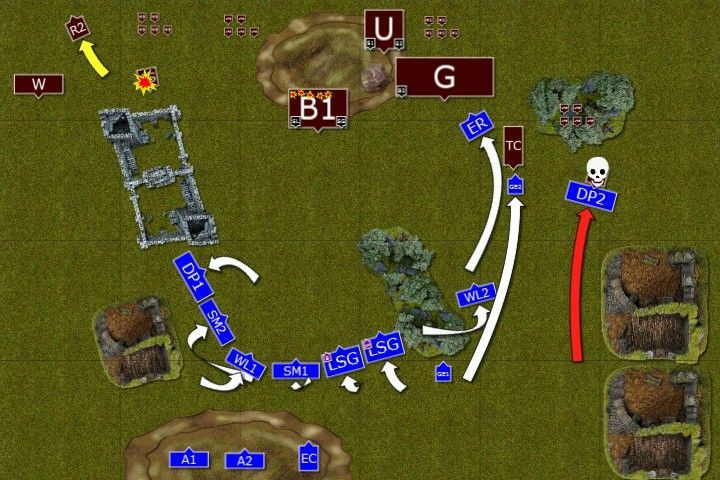 That was the reason I kept my army tight this time and didn't spread out to the flanks. Thanks to that my combat units guarded the most obvious path towards the shooters who had a comfortable position on the hill too. Cavalry was close to intercept chariots. I also kept characters in relative center to use their help with Ld tests. 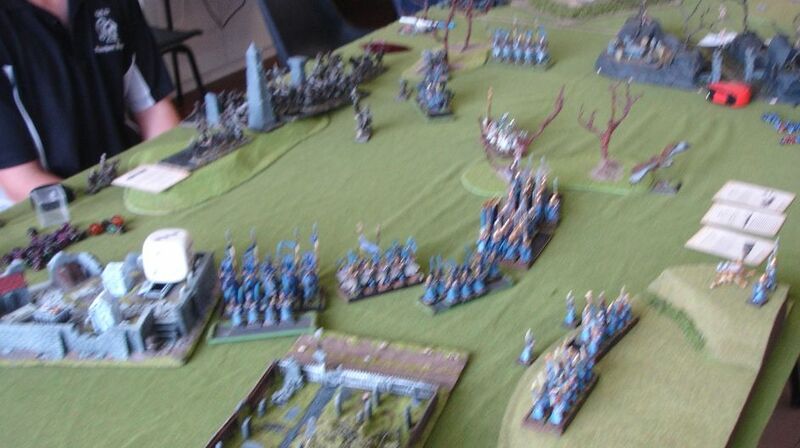 Beastmen army was more spread but as expected with big units all together in the center. Ungors and 2 level 1 wizards were kept behind to keep generating power dice. Fortunately for me there were no spells which summoned big monsters but there were some magic missiles which always are a problem for my army. I was quite happy with the spells I got, searing doom is good against chariots, blades are very versatile, robes are always good to have and transmutation is my answer to hordes. I was lucky to win the roll off again and I got first turn. Elven cavalry moved a little bit forward to be ready to intercept enemy chariots or other support units. The rest of the army moved forward at a steady pace. Razorgor chariot became the first target. The Archmage managed to wound it with his spell and then magically aided eagle claw crew so their aim was improved. That was enough to destroy the chariot completely. Chaos Spawn also suffered from elven arrows but managed to limp away. Beastmen on the West stay in the close vicinity of the nearby ruins, instinctively knowing it offers some protection from the shooting. On the East they are more vigorous but main regiments stay put, guarding their precious herdstone. Only 2 reavers fell victim to vile beastmen spells. Dragon Princes on the East lowered their lances and charged Razorgor, determined to hunt down the beast. Their lances struck home and mutated razorgor was dead. 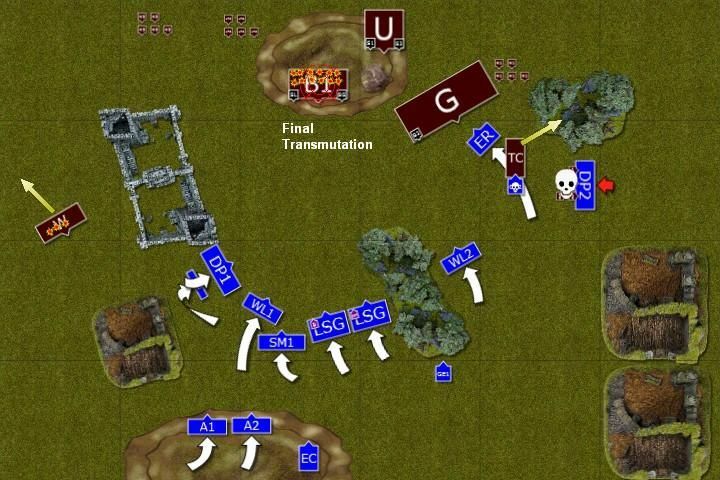 In the meantime reavers and eagle started to harass and disrupt enemy ranks to prevent any counter charges. On the West the infantry advanced. Shooters aimed first at wounded spawn and killed it what spooked nearby razorgor whose primal instincts told it to seek shelter and never come back. With no other direct threat elves aimed at bestigors and a few of the brutes fell down, their dark hearts pierced by white arrows. Tuskgor chariot used the opportunity and attacked the eagle that landed to close to it. But instead of trampling the noble bird both opponents remained locked in combat. Nearby ungors were ordered to intercept elven cavalry and obeyed though that meant certain death for them. Gors also tried their luck but elven light cavalry was too fast for them. 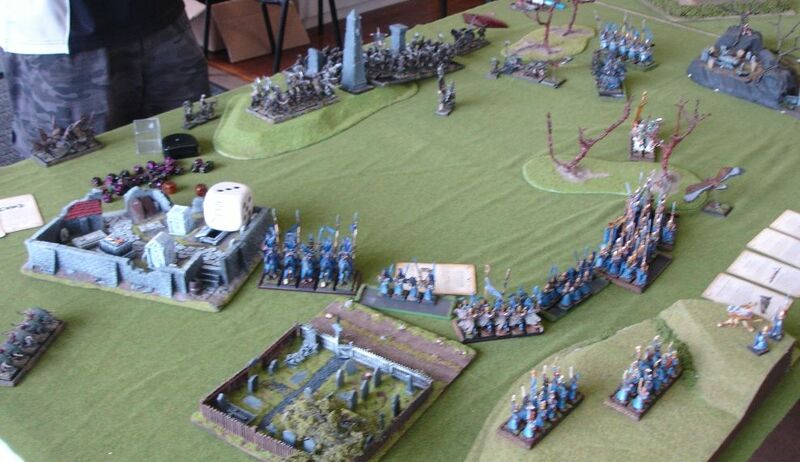 Bestigors moved back on the hill, reluctant to advance towards elven units unsupported. 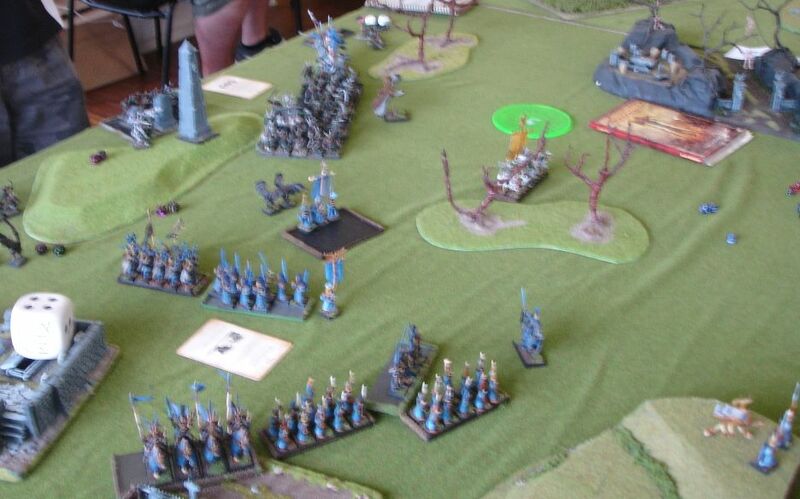 Beastmen shamen attacked this time with more power and one of the units of Swordmastes suffered badly. With fewer enemy units on the center-West elves move forward a little faster. Archers shoot at incoming warhounds and few surviving dogs flee with their tails between their legs. Archmage breaches the defenses of beastmen shamen and plenty of bestigors are turned into golden statues. 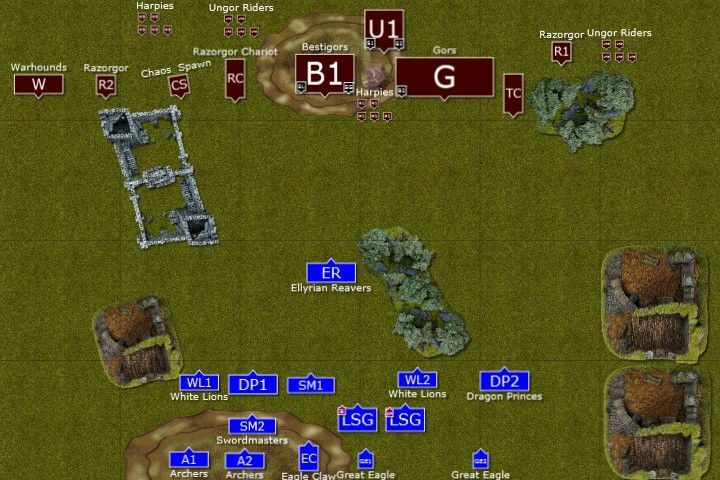 More casualties are inflicted by elven shooting and once big regiment now is barely combat ready. On the East reavers once again move to slow down gor unit while vicious combat continues nearby. Tuskgor chariot finally manages to kill great eagle but shortly after that ungors are destroyed by charging heavy cavalry. That unnerves chariot crew who decides to withdraw to nearby woods. Bestigors leave their dead and turned into gold companions and try to flee to safety. Both great shamen also leave the unit. However, greed is not the alien emotion to beastmen and nearby gors do not listen to their standard bearer orders and try to secure some of the treasure which magically appeared nearby. The horde remains where it was. Only harpies attack the reavers, who try to fight but lose two of their members and the only survivor luckily escapes winged creatures. 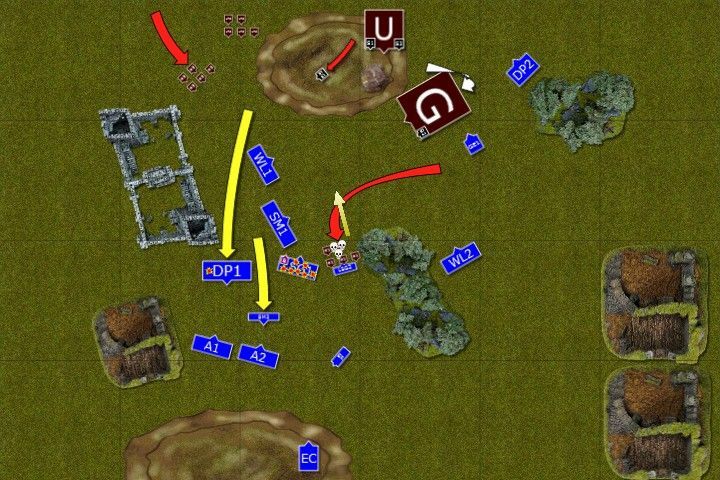 Seeing enemy depleted, withdrawing and confused elves press forward at full speed. 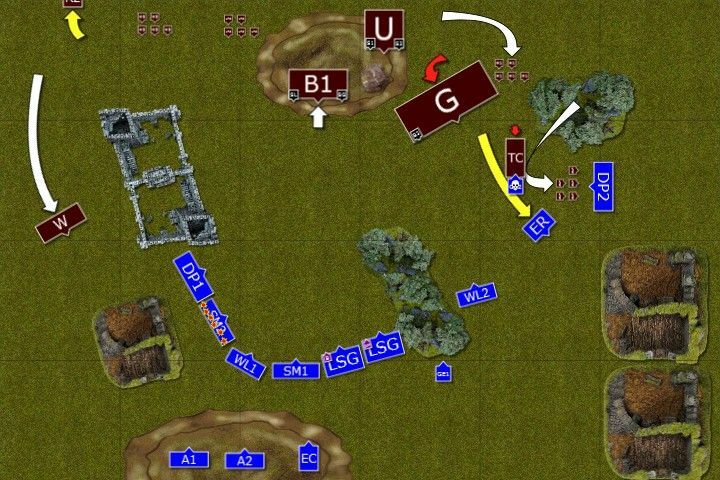 Units on the West line up to surround gors and have a clear line of attack at ungors behind them. Few bestigors trying to run away are picked by eagle claw and elven bsb. 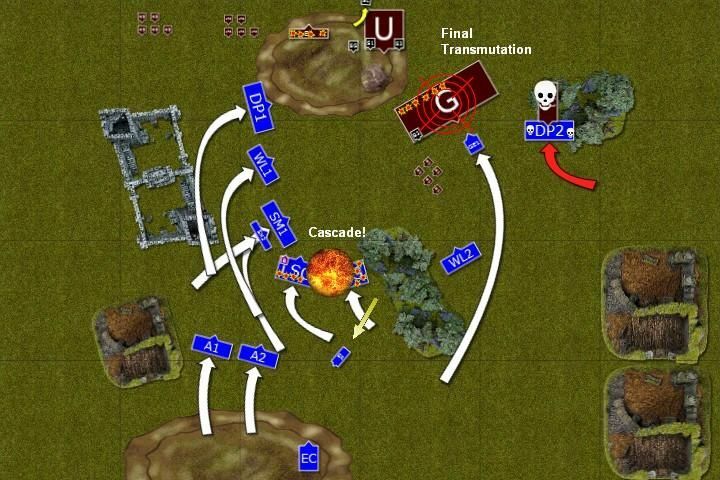 The loss of the unit panics one of the great shamen who flees the battle. On the East Dragon Princes charge the chariot and kill it despite it being magically toughened. Victorious cavalry overruns to the back yard of the enemy. Archmage once again summons the power of final transmutation but this time the feedback is so powerful he cannot contain it and resulting explosion claims him and many of nearby sea guard. That is a powerful blow to elven army! 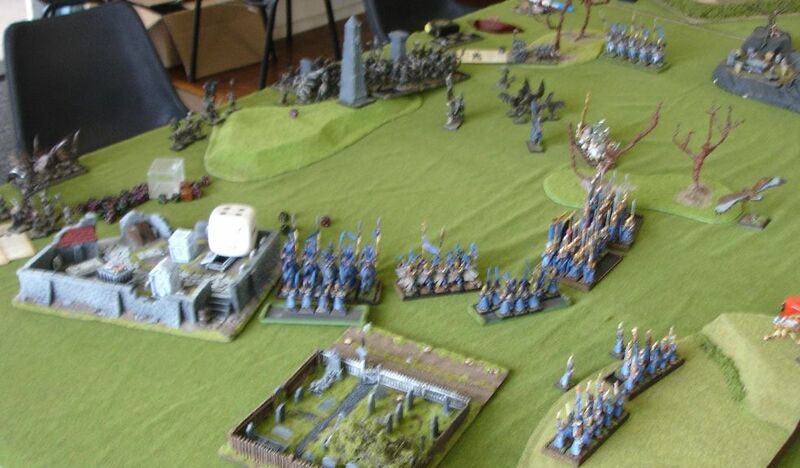 Seizing the opportunity Beastmen attack to push Elves back. That would give them time and space to disengage. 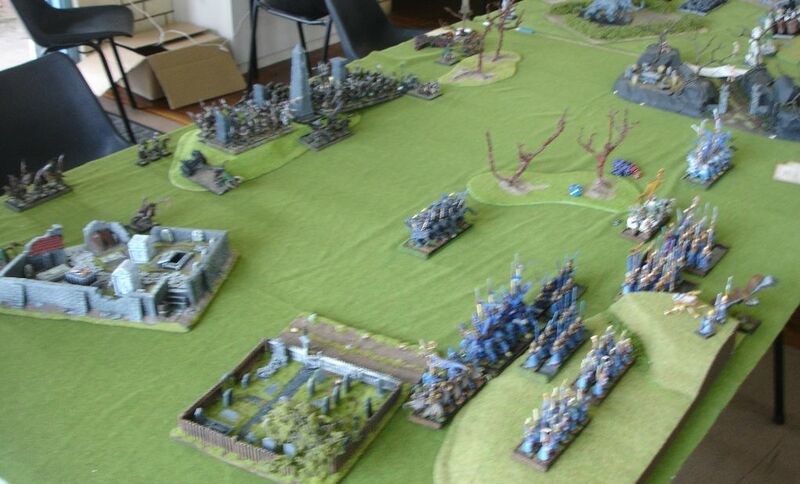 Beastmen great shaman charges enemy cavalry alone and elven knights, knowing there is no magical protection available, withdraw. They are chased by harpies but manage to escape. Another flock of harpies charges three survivors of the sea guard unit but elves fight well and repel attackers. They are unable to catch fleeing enemy though. Great shaman summons his now unchallenged powers and aims at the bsb and his regiment. Although elven battle banner does not topple down, the regiment is no more. Satisfied, great shaman gives the order to retreat before elves can regroup and renew their attack. As always after the game and after looking at the diagrams there are some more conclusions. 1. 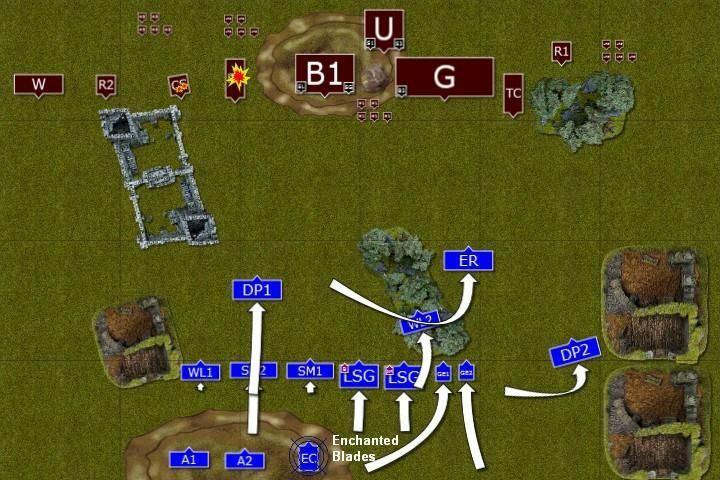 Deployment - I was happy with the way I used cavalry but I was obviously choked in the center -West. I think the better idea would be to place one Swordmaster unit on the East, behind the Dragon Princes. I was considering sending them on the far West but it might be too long way for them to march around the ruins, even if they could control that part of the battlefield easily. I think front rank with cavalry and lions, backed up by Swordmasters in the second rank and sea guard in the center would help me to be in the position to attack earlier. 2. I guess I was also too reluctant to advance faster with the infantry. From turn 2 I should have pressed forward as bestigors had no will to fight anymore and I would have been in the position to charge gors turn 3 maybe. It is of course a pity that we had no time to play full game as 2 more turns was enough time for me to recover from the loss of the Archmage. I could shoot at great shaman and surround gors for last combined charge as I had an eagle to block them and 3 powerful infantry units to kill them. 3. Positioning of the Archmage was a mistake too. I should keep them on the other corner to minimize the number of casualties. 4. The situation in turn 2 and 3 on the East was a very interesting one. Jonathan charged his tuskgor chariot and I expected an eagle to die. I was angry at myself as I had reavers on the overrun path and they would die there too. But then the eagle held. My turn I made a mistake of exposing the flank of white lions to the charge of the chariot the following turn. However, I had an opportunity to choose which combat fight first. I chose the eagle vs chariot and when the eagle died the chariot had to take panic test after ungors were destroyed. It failed and had to flee to the woods instead! 5. Jonathan had a chance to kill my sea guard and bsb with his magic but he didn't choose the right order of spells. He used amber spear first and then used viletide. If he switched the order I would have lost bsb too. That was a very interesting game against another great opponent. We both had some bad luck (Jonathan failed his re-rollable stupidity check for gors due to final transmutation spell and then lost his level 3 shaman due to failed panic check too!). It just shows how many can change in that game with even a single dice roll! Thanks Jonathan, that was a pleasure to meet you and play against your very interesting army. At the end of the day I got 39/60 battle points, 23/25 army presentation and 15/15 sports. That summed up to 79 points which gave me 5th place I was very happy with. I was only 3 points behind 3rd and 4th players (they had 80 points both) where 1st player got 87 and 2nd 84 points, respectively. It was also nice to find out I placed the highest from the all HE players (and there were 5 of us out of 31 players, go Ulthuan!). I was very glad I made it for this tournament. It was nice to see that local community supported the effort and more players than expected turned up. But it was without a doubt worthy. The terrains were simply awesome. I should also add that some players brought their own terrain pieces just to make sure the are enough of themed battlefields. Well done guys! It was also an interesting experience to play with Swedish Comp. Although it was not used in the final scoring it did have an impact. The armies were varied but not really soft when paired against each other. If you took an example of HE armies not two were even a little close in composition. From what I saw among other armies it was a similar thing too. I think it was a great success for players and organizers and I hope it is just a start for a series of annual Jousts. Now that event would not be great without many people I met there. First and most important "Thank you!" goes to Jimmy. Thanks to him the whole idea of coming North was born. He invited me to do so long time ago and I was very glad I could make it this time (I missed one of the tournaments last year). He then took care of me by offering the roof over my head and I had a lot of fun with his family from the start! I feel a little guilty as I kind of forced Jimmy to write a report believing it might be good to analyze the game regardless. But it is one of those games that players want to forget as quickly as possible so my sincere apologies to Jimmy if that was the case. Jimmy, my friend, it was an honor to be your guest and I do hope we will have a chance to meet again. Thanks a lot, without you I could not enjoy the even half as much as I did. Many thanks to the people involved in the organization of the tournament. It was superb example of how much it means when people work together. I am sure many organizers can learn from you! It was great to meet people in person whom I knew from forums. I am glad we met in the pub afterwards and it is just a pity not all could make it. It would be great to meet again!